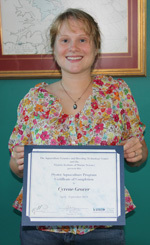 The Virginia Institute of Marine Science recently celebrated the graduation of four emerging professionals needed to advance Chesapeake Bay’s rapidly growing oyster-farming industry. 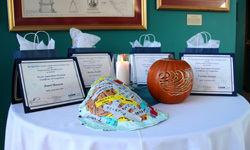 This year’s graduates from the Oyster Aquaculture Training Program (OAT) at VIMS were Marisa Franks of Williamsburg; Cyrene Grover of Lisbon Falls, Maine; Janet Hanson of Largo, Florida; and Jim LaChance of Beverly, Massachusetts. The program—funded by an anonymous donation to the VIMS Foundation—is a six-month training program designed to help meet the demand for trained staff in the oyster-aquaculture industry, and to aid in VIMS’ own oyster-domestication programs. Created in 2009 by Dr. Stan Allen, Director of the Aquaculture Genetics & Breeding Technology Center (ABC) at VIMS, the program runs throughout the oyster hatchery season—from April to September—and is built to teach the trainees all of the various stages of oyster aquaculture by rotating them through hatchery, nursery, and farm grow-out activities. “The program gives the interns a broad understanding of oyster aquaculture and the skills needed to perform tasks in both oyster hatchery and field operations,” says Allen. “What’s more, each of the interns are essentially adopted by the staff in ABC, thus providing seasonal help for the busiest time of year in the VIMS research hatchery." Trainees Janet Hansen and Jim LaChance came into the program hoping to gain knowledge, experience, and a solid understanding of what it takes to make a good oyster, and how to farm them. Now that the program has come to an end, LaChance says he hopes to be able to help the aquaculture industry continue its healthy growth. While the program is designed to give general training in the field, hatchery, and lab, Gregg says the ABC staff also tries to support each intern in their own particular interests as well. Funding for the Oyster Aquaculture Training program was made as a donation to the Virginia Institute of Marine Science Foundation, a nonprofit 501 (c) (3) organization that supports the education and research missions of VIMS.